SHE INSPIRED HER: Interview: How to be a Personal Shopper and Stylist with Zodie Styles plus exclusive readers offer! 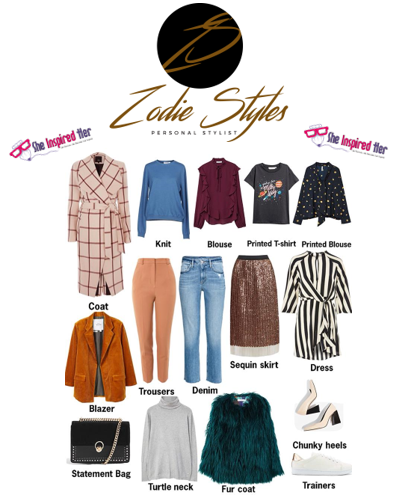 Interview: How to be a Personal Shopper and Stylist with Zodie Styles plus exclusive readers offer! Today at She Inspired Her we have the pleasure of shining our spotlight on Personal Shopper and talented Stylist Zodie Styles! With over 10 years of experience in Fashion Retail, having started out as a Sales Assistant at various stores over the years, moving on to being a Visual Merchandiser for many stores including Urban Outfitters and then having studied at London College of Fashion - Zodie definitely has her feet firmly rooted in an industry that she loves with a true passion for fashion that she is ready to unleash on the world! Find out how this stylish, passionate fashionista made her way up in the fashion industry and how she can boost YOUR wardrobe and style this month forward with a limited special deal for our readers within this exclusive in-depth interview with She Inspired Her! Hi Zodie! You say you started out in Fashion Retail before moving on to being a personal shopper/ stylist? What a great transition! How long did you work in Fashion Retail before setting up Zodie Styles? Thank you so much! I've always been passionate about fashion, I love being creative with my clothes and knew that I wanted to work in fashion. I've worked in Fashion Retail since I was 16, starting from a part time job, moving to full time work and then back to part time work. It's been a long time... I worked at 6 different stores as a sales assistant, but I knew I wanted to do more with my career. During this time I worked alongside the Visual Merchandiser teams where I was able to show my styling skills and I absolutely loved it, it was a great chance for the customers to see what I can do! You also worked at Urban Outfitters, did that period influence you into taking up training at London College of Fashion? If so how and why? Yes! It did definitely. Being a part of such a well known company and a busy store I got to make the most out of my time. My favourite thing was working 1-on-1 with customers helping them to pick outfits for their chosen occasion and I loved how it made them feel in the outfits I put together. I had heard about Personal Stylists before and I wanted to learn more about how to become a Personal Stylist, styling women and different body shapes the right way to get the best results. We know that you are passionate about what you are doing! What was your main inspiration and vision behind setting Zodie Styles? After being told "NO" from many different jobs to become a Personal Stylist in their stores, I thought "Zodie, you can do this by yourself". During my time working in retail for over 10 years, working for someone else and making their dreams come true, it hit me.... what do I want? I knew that I needed to think about my dreams and what I want to achieve and where I see myself in life. So I decided to teach myself and learn everything I needed to know about how to start a business from scratch and ways to improve within my skills. I've always been ambitious, even though I was scared, I knew that with the right determination and focus I could do it! As an affordable high-street shopper myself, who loves finding bargains and saving money, my inspiration behind setting up Zodie Styles was that I wanted to help and teach women how to shop smart. I have always believed a small budget can go a long way to create the wardrobe of your dreams! That's why I started my business because I want to teach, help and show my clients that we can all look amazing and to show them how they can look expensive when working with a small budget. My main vision was that I wanted to have a career where I loved what I did everyday and I was making women feel confident and happy in everything that they wear! For those who may not know your role very well, what do you mean when you describe yourself as a Personal Stylist and Shopper? I help women build their confidence and find their personal style. I teach women how to understand what body shape they are and how to dress their bodies the right way, to love to style the bodies they have, making them feel confident in everything that they wear and (help them to) choose the right brands that suits their lifestyle and budget. I work with women whether they are curvy, slim, tall, short or athletic. I dress them for business, everyday looks, soon to be mum's and for special occasions. I will show you how to dress yourself with creativity…and to not be afraid of mixing and matching colours, whether that’s using your own clothes or putting together a whole new wardrobe. I want to open peoples eyes up to new ways of styling themselves, help them to master the art of shopping for themselves and help them to step outside of their comfort zones! I will go to my clients homes and de-clutter their wardrobes, making sure that they have all the right pieces in their wardrobes to suit their body shapes and that can work interchangeably together. I also shop for my clients, making their shopping experience stress free by selecting the right pieces for them before we meet. What does a Style Consultation entail? This is my favourite part where I can really connect with my clients. I get them to fill out my Style Consultation Questionnaire. It helps me to understand what they are looking for, their desires, body shapes, lifestyles and budgets. That way I can create the perfect mood board for them, choose the right pieces of clothing and select the right stores for their budget. How do you go about creating someone’s Capsule Wardrobe? First things first, I will create a mood board that will help them to visualise what their style will look like. Then I will send them my capsule wardrobe checklist for me to see what they have in their wardrobe already. I will then de-clutter their wardrobe and select the pieces that are their essential pieces, which are the pieces that make a wardrobe complete to be able to make numerous outfits. If we find missing items then we will plan a shopping trip to get the pieces that are needed. Well first it will help you to save money and time and you will definitely not struggle when it comes to picking the right outfit in the mornings. Trust me, you will be prepared for every opportunity that comes your way! I’m here to make life much easier and stress free (for my clients), I know we all have busy schedules and our wardrobe does not need to make it worse. A Capsule Wardrobe is full of all the pieces you love and is a selection of up to 30-40 items that can be mixed and matched together to make interchangeable outfits that can take you through Summer, Spring, Autumn and Winter. What is involved in Virtual Styling and how does it work? I created a Virtual Styling service which is online based for the ladies who want to work with me, but can not meet me in person. Whether you live abroad, live outside of London, have a busy schedule or LOVE shopping online and hate facing the shops - this is perfect for you! Firstly, I would ask you to send me over images of what you wore for 7 days so that I can see your body-shape, see how you put together your clothes along with a summary of how you felt in each outfit and why you chose this outfit. You will get a online video call, home wardrobe edit, an online Personal Shopping session where I will send you recommendations of the pieces you can buy and a Personal Styling session where we will style the pieces in your wardrobe along with the pieces you brought to create outfits that suit your lifestyle. Tell us a little about how you manage to meet your goal in relation to, quote: "women being the BEST of themselves"? I really get into their heads, understand their end result and how they want to feel everyday. When they send me messages with how they feel and pics of themselves in their outfits, I know I have reached my goal! They feel confident and happy. If you could style anyone, anywhere in the world, past or present, who would you choose and why? I would have to choose Theresa May. She is my ideal client, she is just your everyday woman, who has the most powerful role in the United Kingdom. She is in full view of millions and attends meetings with very important people. Being in the public eye I feel your self image is so important. Seeing Theresa May on TV, I've noticed on some occasions that some pieces she wears does not flatter her figure and makes her look bigger than she actually is. Wouldn't you like to look good everyday? You have been kind enough to offer our readers a great deal! Thank you! I am sure they will love it! Please explain what it is and how they can get it! This will be spread over 3 weeks and you must be living in London. To get this offer all you have to do is fill out my Style Consultation Questionnaire and if you receive an email back from me then you have got 20% Off. Simple!